On the weekend we had our Auckland Extravaganza mid-year event. We had over 100 people who crafted their hearts out and loved every bit of it. So how does it work? The event runs for a whole afternoon. The doors open at 12pm and you can view lots of displays and samples to give you plenty of ideas and inspiration. Take a seat for a 12.30pm start. A demonstrator will come and teach you your first project and after 40 minutes she will move on to the next table and another demonstrator will come and teach you your second project. You make five projects throughout the afternoon with a break for afternoon tea. There are also prizes drawn throughout the day. 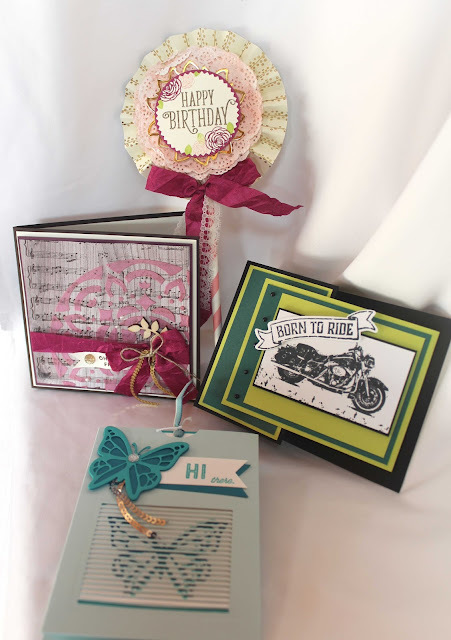 Here is the project that I taught with two other ladies. We took the Wood Crate Die and showed the guests how they could extend it to make a bigger, squarer crate. 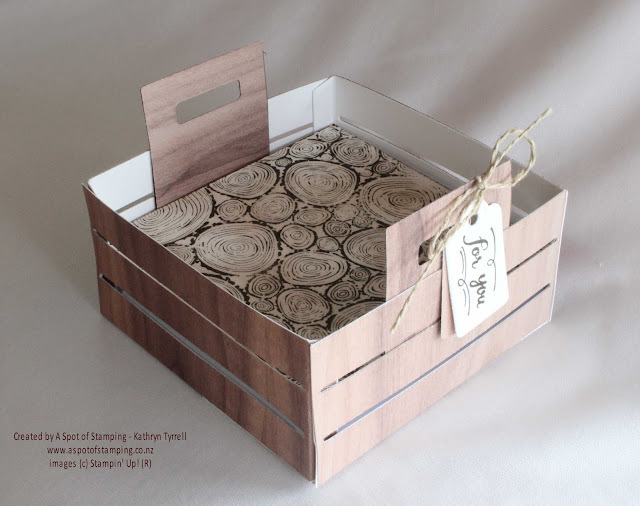 We also used the Wood Textures Designer Series Paper (DSP), so there were lots of different looking crates out there. Here are but a few of the different ones. These ones are all quite similar, but there were some that were very different from the others. We used the Thick Whisper White Cardstock as a base, underneath the DSP to give the cube some strength. This was yet another technique that we showed the guests. On the top of the memo paper we placed a piece of Thick Whisper White cardstock, which we stamped with the Tree Rings background stamp and sponged with Crumb Cake ink. 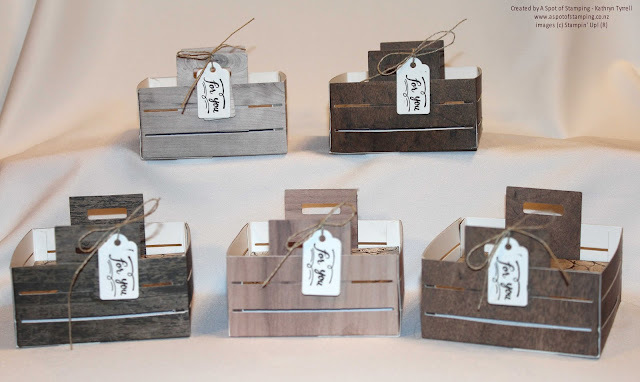 We also used the Wood Words stamp set that co-ordinates with the crate die (you can buy it as a bundle with the crate and save 10%), to stamp on the Whisper White tag. We tied a matching tag from the DSP with it onto the handles with Linen Thread. These will make great gifts, either masculine or feminine, and our guests enjoyed creating them. Each guest receives a gift at their seat and for mine I chose to use the paper I had left over from the memo cubes to make notepads. I glued them together into pads with backing boards and then made a cover to go over them using the new Lemon Lime Twist cardstock and the Layered Leaves Dynamic Embossing folder. 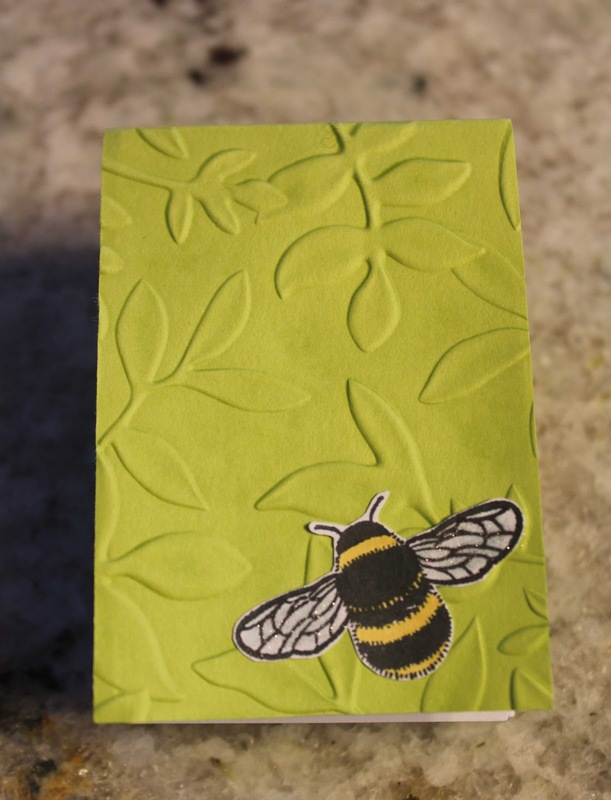 Then I added a cute little bee from the Dragonfly Dreams stamp set. Can you see how I've added a bit of Wink of Stella to the wings to make them sparkle? (very hard to catch on camera). And what gift would be complete without a bit of choccky to eat whilst you're crafting. Finally, here are the other four projects that the other demonstrators taught. 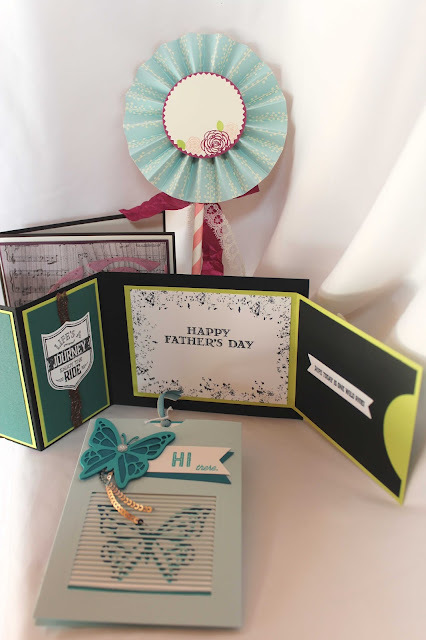 Top: Lollipop Card, Left: Square card uses the new embossing paste coloured with Fresh Fig reinker, Right: Card with gift card pocket inside, Front: Easel card using the Move Me Thinlits dies - the butterfly looks like its wings are beating when you pull the slider up. 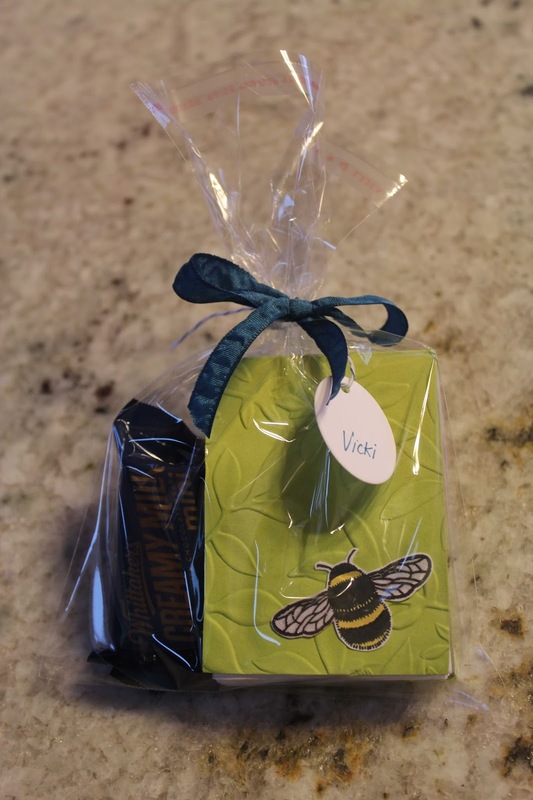 Here is another shot with the lollipop turned around and the gift card open. Our next Extravaganza is our most popular one and is Christmas themed. It will be held on Saturday 18th November in Remuera and I'd love to have you join us. If you're interested, please email me so I can add your name to the guest list. I will also send you more information closer to the time.